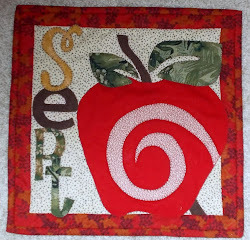 Flower Pot is the third block in the Farmer's Granddaughter Quilt Along for which I am the guest presenter. For those unacquainted with set-in seams, this block may look a bit intimidating. 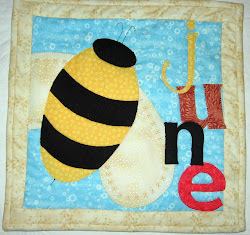 However, I took a class on piecing hexagons recently and think I can apply what the teacher showed us. The two set-in seams in the Flower Pot block are not too bad. In fact, they are actually a gentle introduction to the topic. This may shock you, but I actually used templates and only templates in this block. 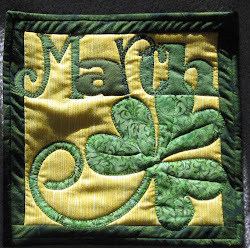 The dimensions were too weird (i.e., irrational numbers) for me to want to redraft the pattern. So, I am actually going to describe the piecing of a block in the manner of the book. And, this time the templates all seem accurate. Background Fabric: three pieces of template #3; two pieces of template #13; two pieces of template #20, and two pieces of template #42. Flower Fabric #1: one piece of template #40 and one piece of template #40R. Flower Fabric #2: one piece of template #41. Flower Fabric #3: one piece of template #41R. Flower Pot Fabric: two pieces of template #13 and one piece of template #39. 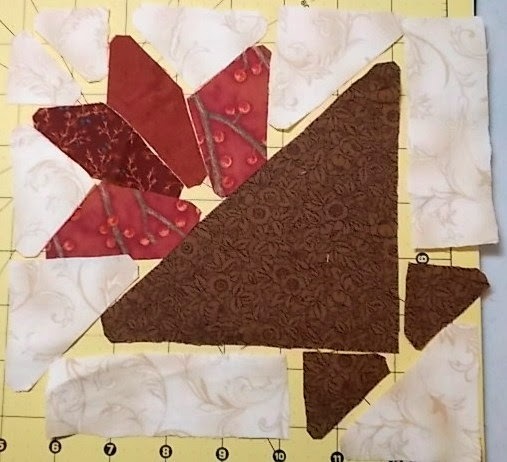 Here is what my fabrics looked like when I had finished laying them out for the block. 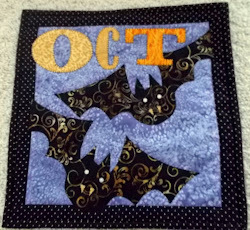 The "trickiest" part of the block will be the set-in seams for the template #40 and template #40R pieces. Therefore, I chose to tackle the flower part of the block first. Then the flower pot of the block ended up seeming simple. 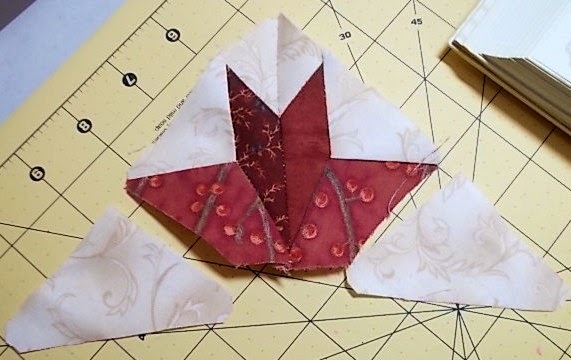 The first two pieces you need to sew together are one of the background template #13 pieces to either the template #41 Flower Fabric #2 or #41R Flower Fabric #3. 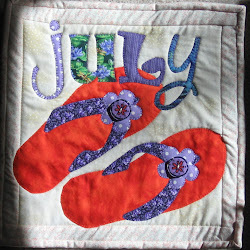 The second pair of pieces you need to sew together will be the one you didn't choose in the previous section. It doesn't matter which one you choose to do first. 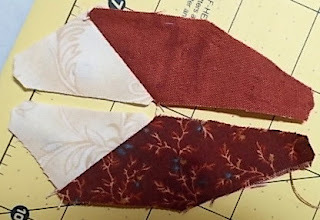 Here are what my first two pairs of fabric sewn together look like. 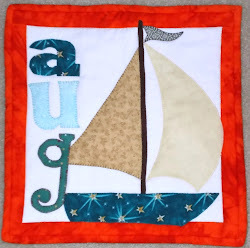 You can choose what piece to sew on to the above sections next, but I chose to sew the background template #20 pieces to the pairs shown above. It is important to mark the seam line 1/4" away from the edge on both your first pair of fabric and 1/4" away from the edge of the right triangle (between the two shorter legs) on background template #20 piece. This what the two sections look like pinned together. Can you see the pencil-point dot on the top pinned part? 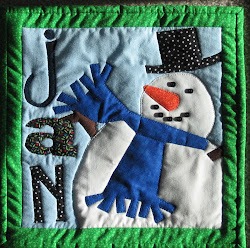 The photo below shows one of the background template #20 pieces sewn to one of the first pairs of fabric. The other one will be just the mirror image of the first. 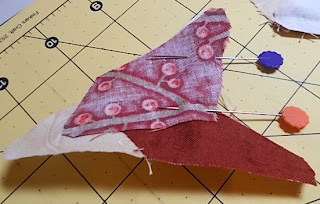 It is difficult to see my seam line, but it's OK to start on the edge of the fabric on the left side. However, you must stop 1/4" from the edge on the right side. Do not press the seam at this time. 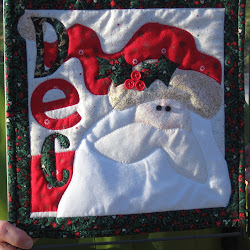 You will find it easier if you can fold the seam in different directions when you are dealing with the inset piece. 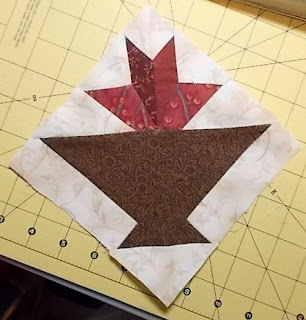 Next you should twist your template #40 (or #40R) piece of fabric and pin the other two parts of your inset seams together. 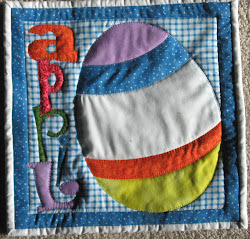 (Do not sew within a 1/4" of the point where the three seams will meet. 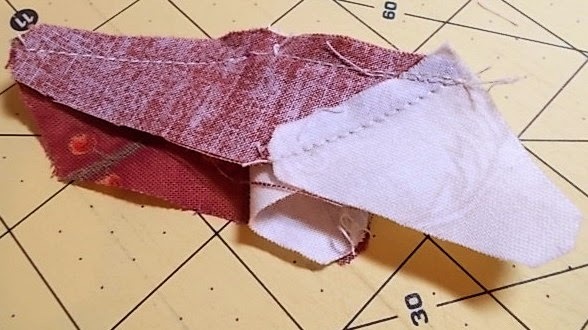 Also, please remember to finger fold your seam allowances out of the way.) 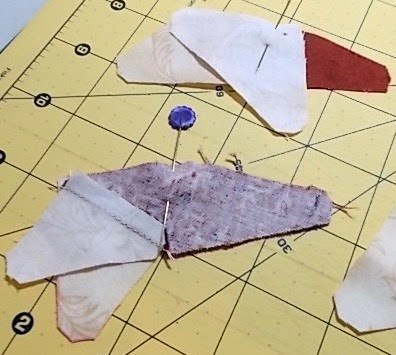 Below you can see what my fabric pieces looked like after I had sewn them together. Now you can press the three seams with your iron. There will be a sort of natural direction each seam wants to lie. 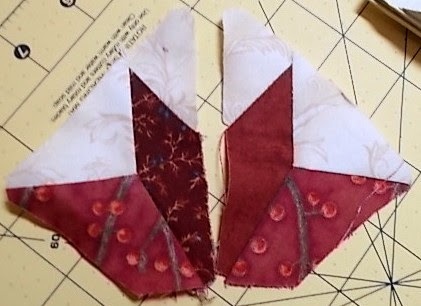 In the photo above from my block, the top seam wants to lie to the right, the right-hand seam wants to lie towards the bottom, and the left-hand seam wants to lie towards the bottom. You should be able to tell what to do with your inset seam because it will be easy to press in one direction and not in the other. This is what my newly pressed sections looked like. Next, you should sew these two sections together. Please remember to be careful matching your points, so your flower is beautiful. 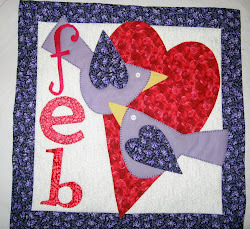 Now you can relax a little bit because the hard part of the block is completed. Your reward is that the rest of the block should go together quickly. 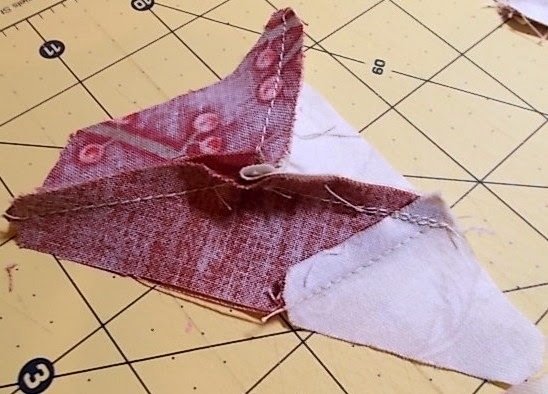 The photo below shows my next layout after I sewed the two sections of the flower together. 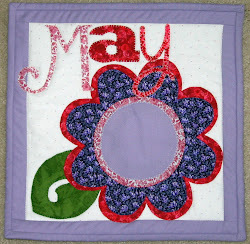 And this is what my flower looked like after I sewed a background template #3 piece to each side of the flower. The photo below shows what my flower pot looked like after I sewed each background template #42 piece to the corresponding flower pot fabric template #13 piece. The photo below shows what my flower pot looked like after I sewed the side seams. This is what my block looked like after a little squaring up. 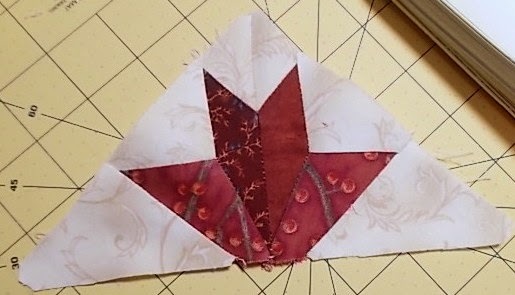 Isn't piecing a block easier when the templates are the correct size?